Yesterday we broke the news that there was an other update that overlapped the EMD update that we had on friday targeting exact match domains. I wasn't sure what that update was, so I emailed our friends at Google and Matt Cutts responded that it was a Panda update that began to roll out on Thursday and has been continuing to roll out even today and will likely finish rolling out through the weekend. This is not a basic data refresh to the Panda algorithm, it is an update to the algorithm itself. Meaning, new sites and old sites are more likely to be impacted even without making any changes. In fact, Matt said 2.4% of English queries were impacted and 0.5% of non-English queries were impacted. 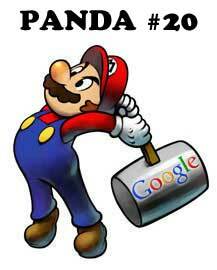 Google began rolling out a new update of Panda on Thursday, 9/27. This is actually a Panda algorithm update, not just a data update. A lot of the most-visible differences went live Thursday 9/27, but the full rollout is baking into our index and that process will continue for another 3-4 days or so. This update affects about 2.4% of English queries to a degree that a regular user might notice, with a smaller impact in other languages (0.5% in French and Spanish, for example). Now, this is overlapping the EMD update! So it would be hard for some EMDs to know if the EMD update hurt them or if it was a Panda update that hurt them. I hate when Google does this but they likely had good reason to do so. Matt Cutts is not dumb, he understands the webmaster - despite what most of you think - and he made a conscious decision to let a major Panda update overlap the EMD update. Why are we moving away from version numbers for the Panda update? Technically, I would have named it Panda 4.0, but Danny Sullivan decided he rather just number them based on how many updates there have been. So we had 20 Panda updates and only 2 Penguin updates (at least on the record). Forum discussion at WebmasterWorld, Google+ and Google Webmaster Help.